Four separate pathologic reviews comprising 957 benign cystic teratomas yielded nine multiple ipsilateral ovarian teratomas. This report is important because of the rare incidence of multiple bilateral mature teratomas. Up to 12 bilateral teratomas were found in one ovary and more than five in the other, which has been reported previously. A 19-year-old female patient, single, with regular periods presented following one day of moderate to severe abdominal pain. The patient’s pain was associated with a history of anoxia, nausea, and vomiting, with no history of change in bowel habits. On examination, the patient was ill-looking, but her vital signs were stable. She had tenderness all over her abdomen, and was felt mass reaching the umbilicus. Her complete blood count was within the normal range. Ultrasonography revealed the presence of bilateral multiple cystic lesions with calcifications. The largest measured 18 × 15 cm with minimal free peritoneal fluid. There were no other findings in the abdominal organs. Figure 1: Left ovarian huge multicystic mass measuring 18 × 14 × 6 cm. Figure 2: Right twisted congested multicystic ovarian mass measuring 6 × 4 × 3 cm. Figure 3: Left multicystic ovarian mass and the inoculated multiple masses of the right ovary. The patient underwent urgent laparotomy. Operative findings were: left huge multicystic mass largest measuring 18 × 14 × 6 cm [Figure 1], and right twisted congested multicystic ovarian mass measuring 6 × 4 × 3 cm [Figure 2]. The left mass was excised while preserving the remnant ovarian tissue. The right ovary with the mass was untwisted, inoculating of up to 12 dermoid cysts [Figure 3] preserving the remnant ovarian tissue. Microscopy revealed multiple cysts with variable mature components of mature skin adnexa, mature neural tissue, respiratory type tissue, and lobules of cartilage. There was no evidence of malignancy. Ovarian teratomas are germ cell tumors, usually derived from one or all three germ layers, composing multiple cell types. A study of yielded teratomas tissues reported components of different tissues characteristics. For example, a study by Shi et al,9 found that a cystic ovarian teratoma surface was lined with mature squamous epithelium with cornifying material and hairs. Sebaceous glands, sweat glands, hair follicles, and fat tissue were also present. Lower abdominal pain is the most common symptom in cystic teratomas (44.1%).22 Torsion is the most common complication, as in our case, and is reported in 3–16% of cases.10 In 2015, there was reported case of multiple bilateral huge synchronous ovarian mature cystic teratomas.20 The patient presented with dull, aching abdominal pain without torsion. However, in some rare cases, torsion presented a serious complication of autoamputation of ovary and fallopian tube. In a rare case reported by Lee et al,23 a parasitic ovarian teratoma that underwent torsion, autoamputation, and reimplantation was found incidentally during laparoendoscopic single-site surgery. The amputated tumor was located in the omentum of the right upper abdomen of a patient with concomitant torsion of a left ovarian teratoma. 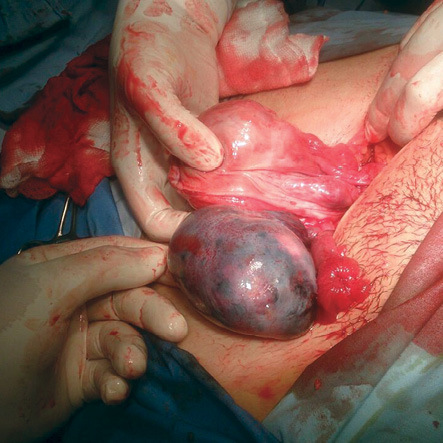 The right ovary and tube were absent even though the patient had no surgical history. The authors interpreted this finding as an autoamputation of the adnexa due to torsion of a previous ovarian cyst arising from the right ovary. Ultrasonography is an investigative procedure that can be used for women of any age as it is excellent and non-invasive.24,25 This is in addition to tumor markers such as CA125, CA91-9, and alpha-fetoprotein, which are used for early detection and characterization of ovarian masses. Future fertility is of major concern among these women. Therefore, surgical management must focus on preserving ovarian tissue and minimizing adhesion formation using laparoscopy.10,27 In our case, laparotomy was done due to the general condition of the patient. The recurrence risk is 3–4% on the same ovary.26 According to Harada et al,28 the predictive risk factors for recurrence are aged less than 30 years, large cyst size (diameter less than 8 cm) and bilateral occurrence, with a higher risk of recurrence in the presence of more than one factor. Laberge and Levesque,26 reported a multiloculated cyst recurrence in a young woman who had a dermoid cyst three years earlier. Our patient should be followed-up for recurrence since she has a higher risk. In the presence of multiple bilateral mature cystic teratomas recurrence — especially in high-risk patients — should be taken into consideration by close follow-up and regular ultrasound examination. Concerns regarding recurrence and associated complications are present in the presence of multiple bilateral mature cystic teratomas. The number of multiple bilateral mature teratomas might reach 12 in patients with unremarkable medical history. Further assessment of patients at risk is essential to save their ovarian tissues in light of the absence of symptoms. We strongly recommend close follow-up and regular ultrasound. 1. Young RH, Clement PB, Suilly RE. The ovary, in Diagnostic surgical pathology, S.S. Sternberg, Editor. 1994, Ravan press: New York. p. 2195. 2. Alotaibi MO, Navarro OM. Imaging of ovarian teratomas in children: a 9-year review. Can Assoc Radiol J 2010 Feb;61(1):23-28. 3. Russell P, Painter DM. The pathological assessment of ovarian neoplasms V: The germ cell tumours. Pathology 1982 Jan;14(1):47-72. 4. Milingos S, Protopapas A, Drakakis P, Liapi A, Loutradis D, Rodolakis A, et al. 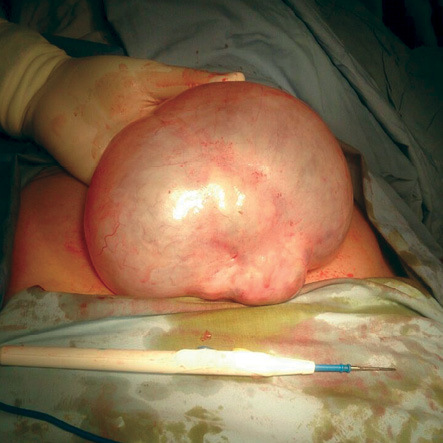 Laparoscopic treatment of ovarian dermoid cysts: eleven years’ experience. J Am Assoc Gynecol Laparosc 2004 Nov;11(4):478-485. 5. Shalev E, Bustan M, Romano S, Goldberg Y, Ben-Shlomo I. Laparoscopic resection of ovarian benign cystic teratomas: experience with 84 cases. Hum Reprod 1998 Jul;13(7):1810-1812. 6. Johnson SC, Jordan GL. Sonographic diagnosis of multiple unilateral ovarian teratomas. J Ultrasound Med 2001 Mar;20(3):279-281. 7. Sinha R, Sethi S, Mahajan C, Bindra V. Multiple and bilateral dermoids: a case report. J Minim Invasive Gynecol 2010 Mar-Apr;17(2):235-238. 8. Baek J. Synchronous occurrence of mature cystic teratoma of the fallopian tube and ovary: A case report. Oncol Lett 2016 Aug;12(2):911-914. 9. Shi X-X, Shen H, Chen T, Pan ZY, Wu XF, Zou ZN, et al. Mature Cystic Teratoma of the Ovary With Three Kinds of Entire Gastrointestinal Wall and Complete Bronchial Structure in a Pregnant Woman. Int J Surg Pathol 2016 Aug;24(5):428-430. 10. Pantoja E, Noy MA, Axtmayer RW, Colon FE, Pelegrina I. Ovarian dermoids and their complications. Comprehensive historical review. Obstet Gynecol Surv 1975 Jan;30(1):1-20. 11. Vortmeyer AO, Devouassoux-Shisheboran M, Li G, Mohr V, Tavassoli F, Zhuang Z. Microdissection-based analysis of mature ovarian teratoma. Am J Pathol 1999 Apr;154(4):987-991. 12. Ozgur T, Atik E, Silfeler DB, Toprak S. Mature cystic teratomas in our series with review of the literature and retrospective analysis. Arch Gynecol Obstet 2012 Apr;285(4):1099-1101. 13. Koonings PP, Campbell K, Mishell DR Jr, Grimes DA. Relative frequency of primary ovarian neoplasms: a 10-year review. Obstet Gynecol 1989 Dec;74(6):921-926. 14. Pepe F, Panella M, Pepe G, Panella P, Pennisi F, Arikian S. Dermoid cysts of the ovary. Eur J Gynaecol Oncol 1986;7(3):186-191. 15. Campo S, Garcea N. Laparoscopic conservative excision of ovarian dermoid cysts with and without an endobag. J Am Assoc Gynecol Laparosc 1998 May;5(2):165-170. 16. Sinha RY, Joshi KM, Warty NR, Frey B. Morcellation in the bag: the superior solution to avoid spillage. Gynaecol Endosc 2000;9(2):103-106. 17. Sinha R, Hegde A, Mahajan C, Dubey N, Sundaram M. Laparoscopic myomectomy: do size, number, and location of the myomas form limiting factors for laparoscopic myomectomy? J Minim Invasive Gynecol 2008 May-Jun;15(3):292-300. 18. Damewood M, Rosenshein NB, Woodruff JD. Multiple benign cystic teratomas of the ovary. Report of two cases and review of the literature. Diagn Gynecol Obstet 1982;4(3):243-245. 19. Comerci JT Jr, Licciardi F, Bergh PA, Gregori C, Breen JL. 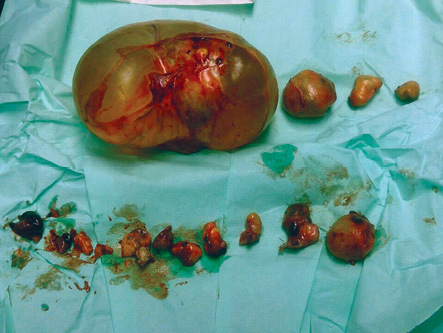 Mature cystic teratoma: a clinicopathologic evaluation of 517 cases and review of the literature. Obstet Gynecol 1994 Jul;84(1):22-28. 20. El-Agwany AS, Moneim AS. Multiple bilateral huge synchronous ovarian mature cystic teratomas: A rarely encountered condition in practice. The Egyptian Journal of Radiology and Nuclear Medicine 2015;46(1):195-197. 21. Johnson JR, Lee C, Carnett S, Vadakekut E. Laparoscopic management of enlarged serous cystadenoma in advanced pregnancy. J Minim Invasive Gynecol 2007 Mar-Apr;14(2):247-249. 22. Peterson WF, Prevost EC, Edmunds FT, Hundley JM Jr, Morris FK. Benign cystic teratomas of the ovary; a clinico-statistical study of 1,007 cases with a review of the literature. Am J Obstet Gynecol 1955 Aug;70(2):368-382. 23. Lee KH, Song MJ, Jung IC, Lee YS, Park EK. Autoamputation of an ovarian mature cystic teratoma: a case report and a review of the literature. World J Surg Oncol 2016 Aug;14(1):217. 24. Al Jama FE, Al Ghamdi AA, Gasim T, Al Dakhiel SA, Rahman J, Rahman MS. Ovarian tumors in children and adolescents–a clinical study of 52 patients in a university hospital. J Pediatr Adolesc Gynecol 2011 Feb;24(1):25-28. 25. Deligeoroglou E, Eleftheriades M, Shiadoes V, Botsis D, Hasiakos D, Kontoravdis A, et al. Ovarian masses during adolescence: clinical, ultrasonographic and pathologic findings, serum tumor markers and endocrinological profile. Gynecol Endocrinol 2004 Jul;19(1):1-8. 26. Laberge PY, Levesque S. Short-term morbidity and long-term recurrence rate of ovarian dermoid cysts treated by laparoscopy versus laparotomy. J Obstet Gynaecol Can 2006 Sep;28(9):789-793. 27. Seracchioli R, Venturoli S, Colombo FM, Govoni F, Missiroli S, Bagnoli A. Fertility and tumor recurrence rate after conservative laparoscopic management of young women with early-stage borderline ovarian tumors. Fertil Steril 2001 Nov;76(5):999-1004. 28. Harada M, Osuga Y, Fujimoto A, Fujimoto A, Fujii T, Yano T, et al. Predictive factors for recurrence of ovarian mature cystic teratomas after surgical excision. Eur J Obstet Gynecol Reprod Biol 2013 Dec;171(2):325-328.